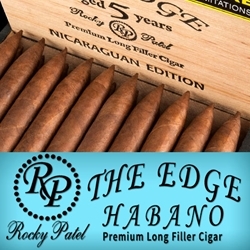 The Edge Habano is the latest line of hand-rolled premium cigars introduced by Rocky Patel. Each of these high quality cigars displays a dark and oily Habano-seed wrapper infused with Nicaraguan aged tobacco fillers and binders from three Nicaraguan growing regions, Esteli, Condega and Jalapa. The Edge Habano is full-bodied, producing an earthy and woody smoke full of rich flavored notes of spice, pepper, and cedar ending with a long sweet and satisfying finish. In 2015, Cigar Aficionado awarded Rocky Patel The Edge Habano, the #7 Cigar of the Year. These premium cigars make a great addition to any cigar connoisseur’s humidor. The Edge Habano by Rocky Patel can be delivered right to your front doorstep! Smokers Discounts has made it easy and affordable to buy hand-rolled premium cigars online. A variety of sizes and flavors are listed below in our online cigar store. Each of these styles are in stock and available for a low discount price! Call us for more details!